The U.S. says China is building a fleet of man made islands in the Earth’s upper atmosphere in an apparent wide reaching space grab. Beijing launched a manned spacecraft destined for China’s space laboratory from the Gobi Desert on Monday, which was piloted by two Chinese astronauts Rob and Dave. The two astronauts were spotted in space by U.S. radar on Wednesday in what appeared to be heavy earthwork machinery. 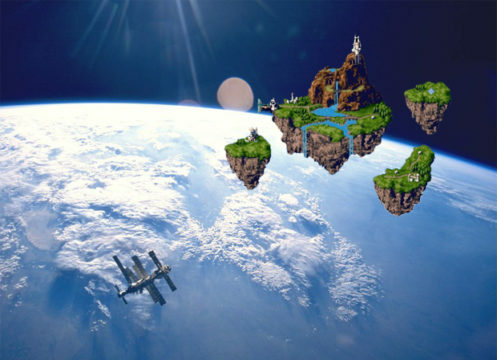 The space landmasses discovered by NASA have reportedly been designed in the form of the islands in Miyazaki Hayao’s Castle In The Sky to specifically irritate Japan. The Japanese government says it has been shocked by the speed at which the four separate masses of land have been constructed, with the main island having an 80-foot high waterfall and mini castle. “We just can’t believe the efficiency of these two Chinese men, it’s so incredible we’re not even mad,” said one Japanese government official.